A pool filter is a very important part of a pool and to make sure it’s working to optimal performance is absolutely necessary for a clean and sparkling pool. Dirt and contamination can be brought into your pool by the wind, swimmers, and even pool toys. There are a few different types of pool filters including Diatomaceous Earth Pool Filters, Cartridge Pool Filters, and Sand Pool Filter. Sand Filters are basically large tanks that are filled with a special kind of sand specifically for pool filters. Then the pool water is pumped through the sand inside the tank, where it filters out any particles before the water is returned to the pool. Once the particles build up inside the tank, you can backwash it to flush out the filter. Cartridge Filters are tanks, only slightly smaller than a sand filter which has a cartridge filter inside it. The water is filtered through the cartridge where it collects the particles. To clean the filter, all you have to do is remove the cartridge and spray it with a garden hose. Diatomaceous Earth Filters (D.E Filters) are big tanks that have fingers or grids inside it which are covered with a D.E powder. This power acts a little like sand but is more effective, and the pool water is filtered through it. To clean you have to backwash the filter and add new D.E powder. However, it can be difficult to know what filter is the best to suit you and your pools needs. It all depends on the kind of pool you have and the requirements you need for the pool filter. The size of the filter is the one thing that determines how well it will perform no matter what size the pool is. We have provided this helpful guide to show you the best pool filters on the market and help you to decide which is best for your pool. 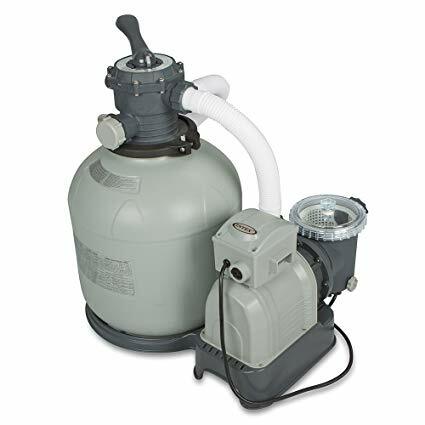 This sand filter is a one-piece unit with the only opening being at the top. It’s made from a reinforced thermoplastic with a coating of colorfast so it works well in all types of weather. The tank is also corrosion-proof. This unit is very easy to use and is very durable, which means you a sparkling clean pool for a long time. It includes a diffuser on top of the sand, so the water distribution is even as it flows over the top of the sand bed. The unit has a seven-position backwash control valve which is also on the top as well. This system comes in five different sizes — 22, 24, 27, 30, and 36 inches. Therefore, it has a system called Vari-Flo which means the flow rate depends on the size of the pipe used but can be anywhere between 20GPM to 160GPM. This unit was designed to get the best flow speed possible at whatever level of pressure you have, which makes it a very efficient unit. It was designed to be hassle free and easy to maintain. It gives you excellent filtration and clear water in your pool. It is energy-efficient and saves you money when running properly and using all the sand and water flow techniques when it can. This unit is also simple to clean by just backwashing the filter and can be completed in only a few minutes. Is made of corrosion and weather-proof materials which can hold up under any type of weather. To make it speedier, it comes with a huge pressure drain made of either sand or water. It’s is easy to clean by backwashing the filter. It is highly energy-efficient and saves you a good amount of money when it comes to electric bills. This is due to the full-flow technology. The packaging is not ideal with the product jostling around inside a large cardboard box, especially when you have spent lots of money on the product. This unit is perfect for residential pools and is made with a 420 square foot capacity inside the filter. It can collect large amounts of particles and dirt when not cleaning as well as during, without decreasing the overall performance of the filter. The larger capacity inside the filter means you don’t have to clean as often as you might think in order to keep a clean pool. However, this might be different if you have an over-hanging tree or more debris in your pool than on average. Usually, you will only have to clean the cartridge once or twice a month which makes it very low maintenance. This unit has an injected-molded one-piece body which makes it seamless and strong. It is made with fiberglass-reinforced polypropylene which makes it impact- and corrosion-resistant. Inside, it uses four polyester cartridges which are non-woven which means it can handle big pools with ease. It also includes a waste drain plug at the bottom of the unit. It can also split in the middle which means you have easy access to the cartridges in order to clean them. There is no need to backwash this unit as you just remove the cartridges and hose them off to clean them. This unit is a vertical grid filter, used for in-ground pool and spas no matter what size or shape or type of pool. It works by pushing the unfiltered water into the filter element and then distributing DE into grids. It has a one-piece clamp that is very heavy-duty which is used to fit the top of the tank and the bottom of the tank together perfectly and securely. This means that maintenance of the unit is easy and allows quick and convenient access to the inside of the model, meaning you will not have to mess with the piping connections. This unit can be used for both commercial and residential use as the size and power which means it can handle both perfectly well. It is made of Perma Glass XL which is reinforced copolymer making it durable and very strong. This means it will last for a very long time. There are both multiport and side valve options for some of the models in this range, so you get the choice. It also includes an indicator gauge which shows you the pressure and tells you the cleaning-cycle, so you know when it’s clear to start the backwash. The grid elements are high impact and are used for up-flow filtration and top-down backwashing. This is designed this way because dirt and debris will flow better downwards, with gravity. This model comes in five different sizes — 24, 36, 48, 60, and 72 square feet so you can choose which suits your needs best. Its GPM ranges from 48 to 144 depending on the size you purchase. Very easy to install and use as there is a lever that turns so you can control the settings. This is a great option if you’re on a budget but need a filter that works as well as any other. It needs little maintenance and sand to filter your pool. It also has a valve which gives you the options to backwash, drains, recirculates, and closes the system which makes it incredibly simple to use. It includes a twenty-four-hour built-in timer so the cleaning of your pool remains hassle-free and easy to do. It has four different models in the series which operate at 1050 GPH, 1600 GPH, 2150 GPH, and 3000 GPH. The most powerful one works for about ground pools as large as 16 inches and above. It is amazingly low maintenance, meaning you only have to replace the sand every five years and still works to its optimal capacity. It works with varying sizes of Intex pools and is compatible with other Intex pump systems and other Intex branded attachments for pools. It includes a Ground Circuit Fault Interrupter (GCFI) which means it has circuit breakers to cut off the current flow into the system when an abnormality occurs which helps you to avoid incidents you don’t want. It also uses a 110-120 voltage. The sand it uses is touted which makes the filtration much more effective than other systems. It refreshes, softens and clears the water of algae, as well as making it sanitized and replenished. It uses six modes of control which include backwashing, filtering, and rinsing, as well as recirculating, draining, and closing the system. These controls are automatic and use a motor of 0.95 horsepower. 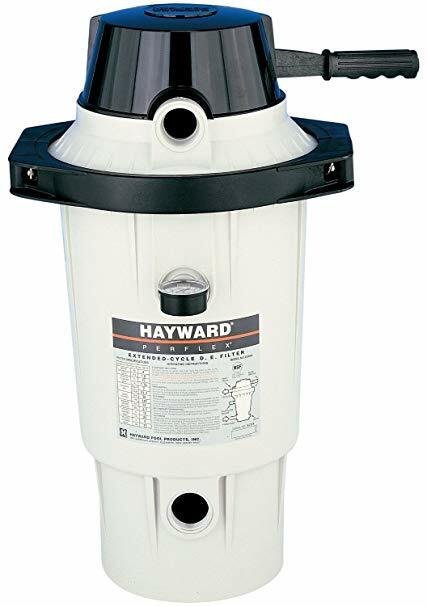 This Hayward D.E pool filter can be used for both above ground and in-ground pools of all different sizes. It comes in three different models which differ in size depending on what the needs of your pool are. The maximum pool size it can clean is 19,000 gallons with an 8-hour turnover rate. It is a heavy-duty unit which is corrosion-free and extremely durable which will give you optimal performance for a long time. It can catch particles of one micron, which is a lot tinier than other systems which average the ability to catch five-micron sized particles. It does a very good job of removing tiny particles from the pool water to give you beautiful, clear, and sparkling pool water. It also has the ability to catch algae, along with debris and small particles. It usually catches the particles on the first pass through the filter system, meaning it won’t allow them to pass back into the pool. It has less resistance so it’s very energy-efficient, meaning you use less electricity and water in order for it to work at its optimal performance. It also has a dependable and reliable cleaning power which will work to make your pool cleaner than other types of filtration systems. There is less cleaning of the system as well, as you only have to clean it every 8-weeks depending on the amount of dirt in your pool. It includes a feature called Flex tubes which are patented filter elements which reuse D.E filter media as well as the dirt mixture which forms a fresh new filtering surface in an efficient way. The bomb handle on the system is what activates the Flex-Tubes. It also has a 1 horsepower pump called the Power-Flo Matrix. There are so many different types of pool filters on the market, it can be difficult to know which one is right for you. While you start to look for a pool filter, you should keep some things in mind so you can gain the best filter for your pool. The first step is to work out which type of filter system you need for your pool, whether it’s sand, D.E, or cartridge. They all have their benefits, and their drawbacks, but once you recognize which one would suit you and your pool best, you can start looking into that type of pool filter. Another is to consider what kind of dirt and debris get stuck in your pool. Is it only leaves, dirt and twigs? Or smaller impurities? The word ‘micron’ is used a lot when researching pool filters and these are the main particles that your filter system will work to clear your pool of. One other important thing to consider before buying a filter is choosing the right size for your pool. You’ll need the right sized filter in order for it to work at optimal performance. Some might recommend buying a filter that is bigger than you would normally buy to fit your pool. This means you will have more surface areas and longer periods of time between cleaning the filter. Probably the most obvious and important benefit to having a pool filter is the removal of dirt and impurities in your pool. As you swim the water washes dirt and particles from your body, leaving them in your pool. A filter system works to draw the water in and catch these particles, so you don’t have to swim in a dirty pool. If the filtration of the water goes through in a gentle cycle, it is less likely that you will need to add more chemicals to the water in order to disinfect it as this is already being done for you. This means you are not wasting money or products or swimming in an overly chemically rich pool. Similar to the first point, a filtration system will clear your pool’s water, so you aren’t swimming in cloudy or green water. This makes the swimming experience must more enjoyable and keeps your pool looking brilliantly clean and crystal clear. Having a filter system means you don’t have to use excess energy to clean the pool yourself, taking time out of your day and using your own elbow grease to clean the pool manually. This means you get to spend your time actually enjoying your pool while your pool filter does all the work for you. These pool filters are easy to maintain, adding to the last point, meaning you don’t need to clean it all the time, depending on which filter you choose. Once installed they work hard to keep your pool consistently clean so you don’t have to worry about it. Just clean the filter every now and again so it can keep doing its job. In conclusion, there are many pool filters to choose from and we understand how difficult it can be to know what one you might need to fit your pool requirements. You can choose from sand, D.E, or cartridge, each with their own benefits. A sand filter is cheap to buy and maintain, is very effective in cleaning medium to large debris, known to be reliable for a long time, and the sand only needs replacing about every 5-7 years. A cartridge filter has very easy maintenance, no need to backwash, a much larger filter area, and saves energy and water while working. A D.E filter gives the best result in clearing the water, the powder is refillable through a pool skimmer, and it’s a reliable system for a very long time. Each of these filters are designed to work well in any type of pool but looking at the benefits of each one you need to decide which is best suited for you. 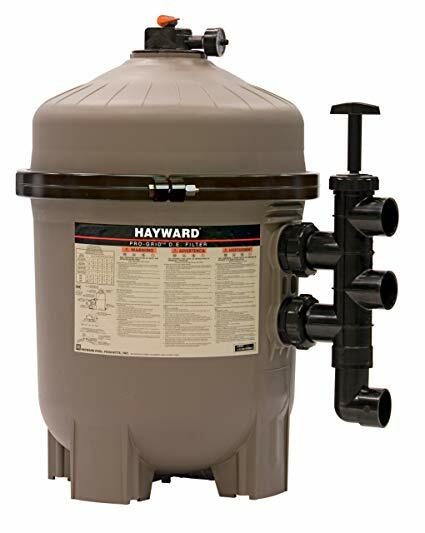 Perhaps the Hayward ProSeries Sand Filter with its anti-corrosion and weatherproof material and durability is the best option? 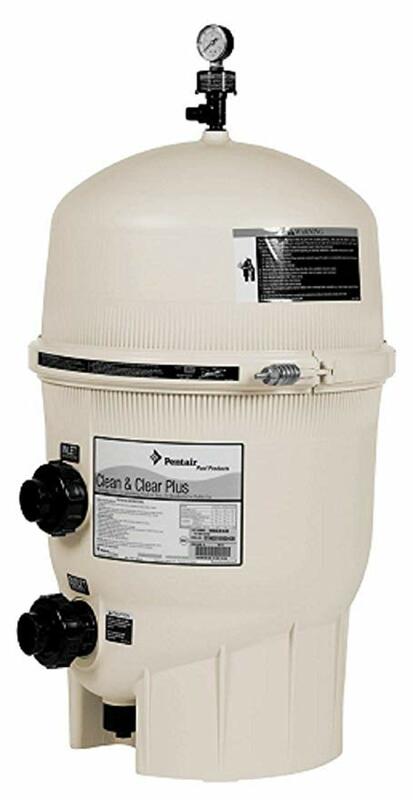 Or the Pentair Clean and Clear Cartridge Filter with its huge filter capacity and 100% draining port? 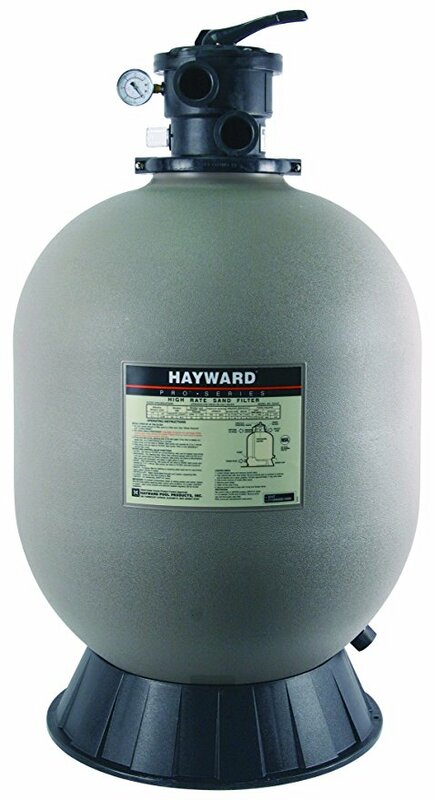 Or the Hayward Vertical D.E Pool Filter with its Perma Glass XL material and advanced features is the one for you? Either way, a pool filter is the best option for maintaining your pools sparkle and removing the impurities from it for a more enjoyable swimming experience. Buying and installing one means you don’t have to do the grunt work or add any extra chemicals to the pool. Most models are easy to install and easy to use and free up your time to do whatever you want while it works. When buying a pool filter remember to keep in mind some of the things we have covered so you can have a pool filter that works in tandem to your pool and fits it perfectly. Keep in mind the size of your pool, the size of the debris, and the size of the filter you need.